Digital Nursery Interactive table is a great way for kids to learn while having fun. Covering the six Early Learning Goals, it combines fun games and activities with creativity, learning about maths, the world around us, emotions, responsibility, music with lots of other fun and educational programs available besides. "We were instantly attracted to Digital Nursery’s interactive table at the Education Show. We had been looking for a simple way to bring IT into our preschool room in a more interactive form than the PC. We had considered purchasing a smart board but when we met the sales team from Digital Nursery we quickly recognized that it was entirely suited to our needs. The menu, games and operating systems are simple enough for our 2-4 year olds to understand, even if the staff required some basic training! Staff play with small groups to support children with numeracy, literacy and problem solving skills – making observations for their journals. It is also accessible enough to leave switched on in the room so that children can access it independently and explore in their own time. We were worried about the screen being damaged and the programs being tampered with but this table is really robust inside and out. We are a busy setting but the table has survived heavy use and still looks great. The team at Digital Nursery are very helpful and supportive, they are excellent at helping you to make their equipment bespoke to your needs. We highly recommend the interactive table as an innovative but reliable way to bring IT into your setting, it has been money well spent." "We are delighted with our screen. Please don’t hesitate to give our telephone number to prospective customers if you would like us to recommend you." 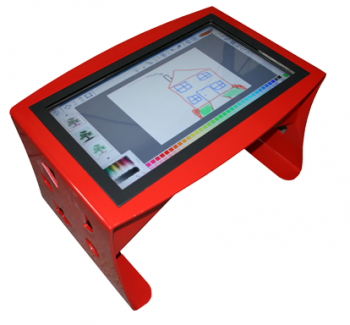 "Here at Daisy Day Care we are extremely pleased with our interactive table and digital notice board. The service and advice we receive from 10 squared has always been excellent. They are very helpful and nothing is too much trouble for them. I would have no problem recommending 10 Squared to future customers. The parents at our setting are very impressed with the equipment; they love to see the pictures on the notice board and are fascinated by how the very young children soon master the interactive table. My only concern is that a certain engineer is drinking us out of coffee (you know who you are!!)" "We have had our screen in for well over six months and it has proved a massive bonus for us in showing what the children are doing and in getting messages to parents." "We considered buying a TV and PC and linking them together, but this proved more difficult than we thought and didn’t give the impact we wanted. "After some investigation I came across Digital Nursery and their friendly and professional approach, couple with the simplicity of the plug and play display made it an easy decision. "We didn’t have to think about buying the right bits and pieces as they did it all for us and we got it in a lovely bright colour which we were able to choose. "The children love seeing their work on the big screen and it’s so easy to put it on that the older children often help do it and we can change it several times a day if we want. "After seeing the products being demonstrated at a friend’s nursery we approached Digital Nursery to enquire about the suitability for our school. We use them in our phonics booster classes. Digital Nursery gave a full demonstration and assurances that we could have what software we needed installed. The screens are considerably cheaper than some by rival companies and the service was second to none. Although we have had no problems with the equipment Digital Nursery have remained in contact to ensure that we are happy with our purchase.